Monday’s second debate between Democrat Rich Cordray and Republican Mike DeWine has been described, perhaps somewhat teasingly, as wonkish and awkward by many commentators. 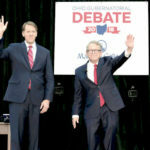 Cordray and DeWine largely kept their discussions to political differences, a stark contrast to other nationally prominent races that have turned personal and aggressive nearly from the jump. As in their first debate, Cordray was quick with zingers and clapbacks throughout the evening, firing at DeWine’s poor record on healthcare by offering that the Republican’s campaign “should carry a warning from the surgeon general: electing Mike DeWine as governor will be hazardous to your health.” He also made light of the fact that DeWine, Ohio’s Attorney General since 2011 who succeeded Cordray’s two years in the same office, has found away to pin all blame for the state’s issues on the Democrat’s brief tenure for things he hasn’t solve in his eight years. And, like in the first debate, DeWine continued to shamefully demagogue about Issue 1 — a proposed constitutional amendment that would help to limit mass incarceration for non-violent offenders and reduce drug usage or possession felonies that do not involve trafficking to misdemeanors — and misrepresent the proposal to (wrongly) suggest that Cordray would be putting violent drug dealers back on the street. Underreported in the coverage of the debate were the sharp contrasts between the pair, buried in the wonkish policy talk. Where Cordray distinguished himself from DeWine was in outlining who he will stand up for and stand up to. On issue after issue, Cordray showed willing to invest where investment is needed. Cordray committed to restore local government funding and send fracking tax proceeds back to impacted communities. Cordray outlined a comprehensive plan to invest in the state’s roads, bridges, transit and broadband infrastructure and was the only one on the stage to commit to fixing the state’s school funding system. Cordray also committed to taking on the thorny issues that others have ignored. He offered a strategy on guns that takes them out of the hands of dangerous individuals, while DeWine pretended the gun problem can be eliminated by better programs in schools. Cordray pivoted from DeWine’s 11th hour conversion on Right to Work to note the Attorney General went out of his way to sue to deny overtime protections to low-wage salaried workers in order to help business owners. There are serious, substantive differences between Rich Cordray and Mike DeWine and they’ll have significant consequences for every day Ohioans when the ballot box determines the winner in November. Cordray and DeWine have one more debate remaining, a scheduled exchange at Cleveland State University on October 8.